← Embellish is for BOYS! My Little Country Princess…Little Kiwi Blog Tour! I’m so excited to be a part of Little Kiwi’s first blog tour. I just love Little Kiwi’s patterns and have tested so many. They are always fashion forward, unique, and fun. I think my little girl has grown up wearing several Little Kiwi outfits. I have even won a contest with the Estrella’s Apron Top and the Sweet n’ Sassy Bubble Shorts patterns! You can see the post here. 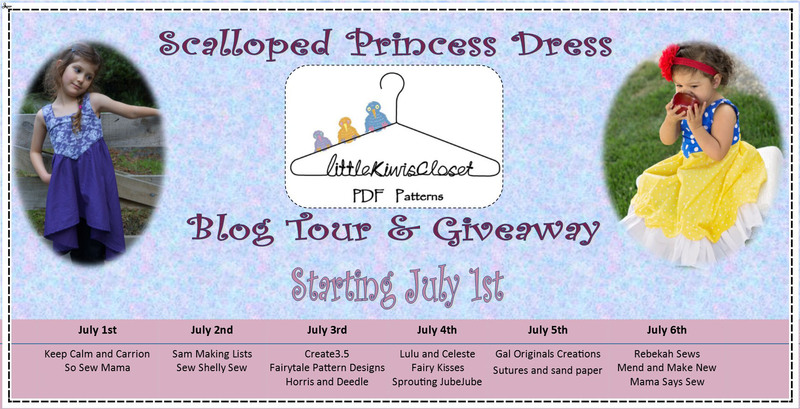 So when Lydia announced she was doing a tour of her new pattern the Scalloped Princess Dress I almost didn’t participate. 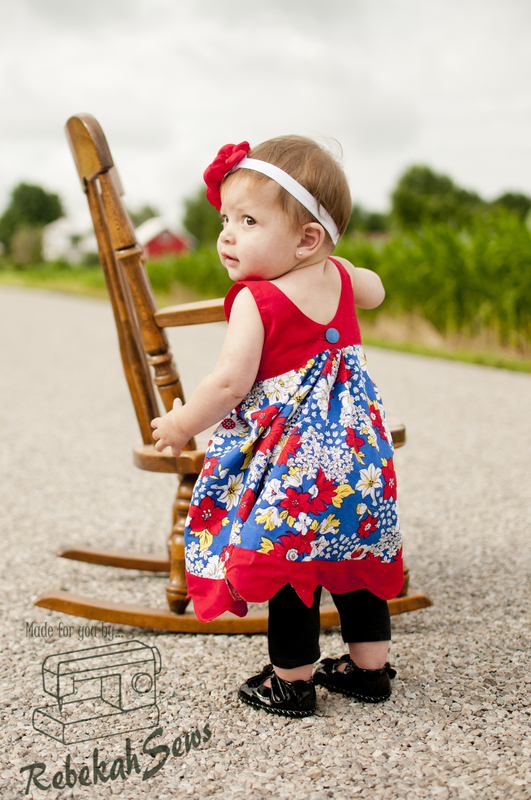 Not because I didn’t have the time or the desire but because this dress only comes in sizes 12mo-9yrs. This isn’t because infants can’t wear this dress, but because this dress is more for the older girls to fulfill their princess dreams. Yes, this dress is just perfect for making any little girl her favorite princess. Don’t let this limit you to only making princess dresses though. 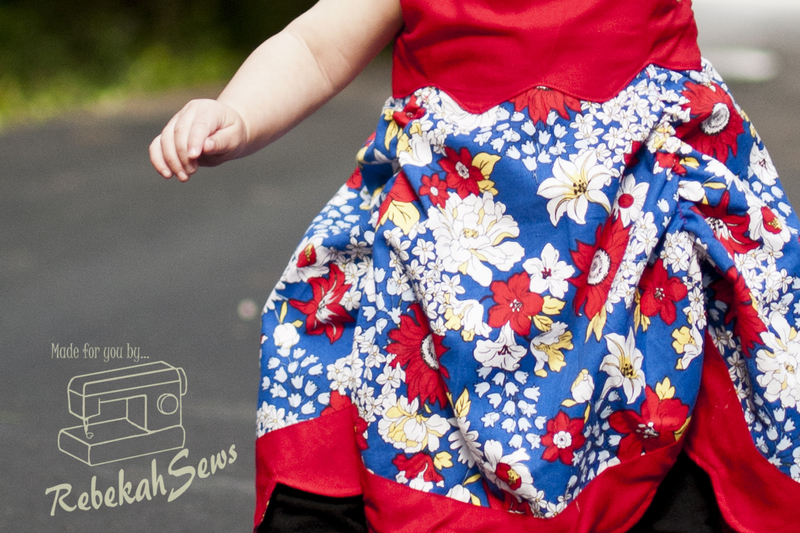 This dress pattern is perfect for making a formal gown for special occasions, a cute summer dress, or really anything your little girl can dream up! You may be asking at this point, “How can one pattern do so much?” This pattern is full of options!!! You ready for them all??? Yup, you read that right!! Like I said, this pattern is only limited by your imagination. 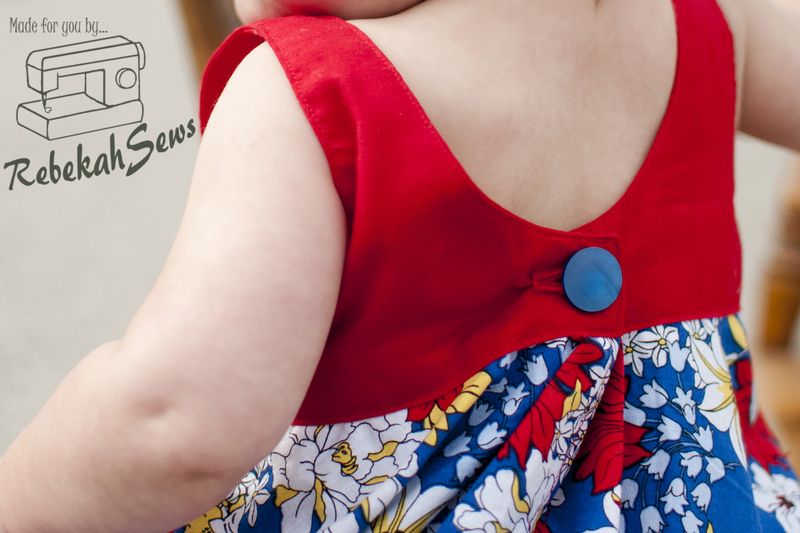 Because there is a bodice lining, button hole, and a scalloped edge option; this dress is classified as an advanced beginner pattern. Don’t worry though, as Lydia does a great job with taking you step by step through each option in order to make your princess the dress of her dreams! Did you see the back? Just as dreamy as the front in my opinion. It closes with one or more buttons depending on size. I love the scoop in the back as it adds a little dreaminess. There is also a gusset on either side which adds that last special touch! It’s time to tell you all about my dress! Now even though my little princess is 10 mo old, she is still in RTW (ready-to-wear) 3-6mo or 6-9mo. She is a petite little girl. So in order to create this dress for her I had to down-size the pattern. This actually isn’t hard to do. You measure the average distance between each size and use that measurement to draw a smaller size from the smallest size in the pattern. Clear as mud?? So my dress is about a 6-9 mo size. I like to add a little something of my own just because it’s fun to see what else you can do with a pattern beyond the instructions. At 10 mo old my baby girl is all over the place getting into everything! Not walking yet, but she crawls lightning fast! I love dresses on her but it is harder for her to crawl in them because they get caught under her and she gets sooo frustrated. I love dresses on her because she is my only girl and I love dressing her like one. So I wanted to pull the front up a bit and give her some ease to crawl in. I accomplished this by sewing two pieces of elastic into the skirt to give it that ruching effect. It also gave it a more hi-lo effect as well. Double win! For the elastic, I made the elastic length half the length of the skirt in order for it to be pulled up enough. 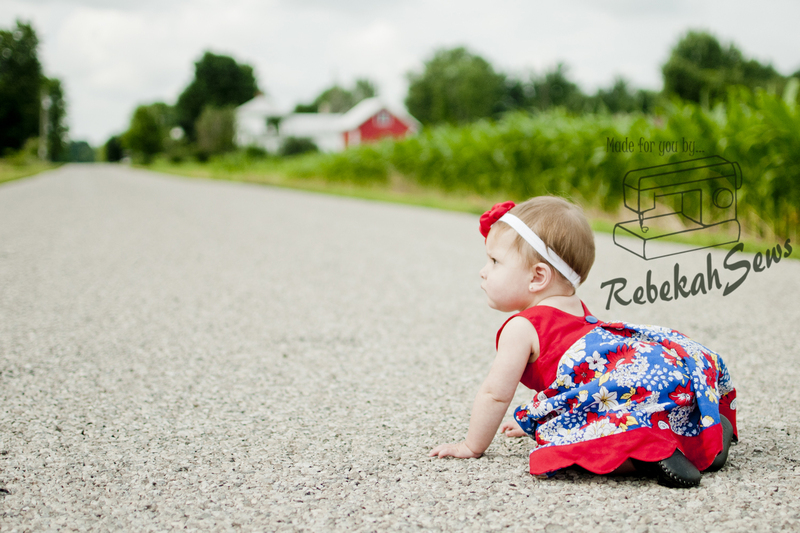 This worked well and she was able to crawl around just fine! Has your little girl been begging you for a princess dress? Maybe just a dress up dress? 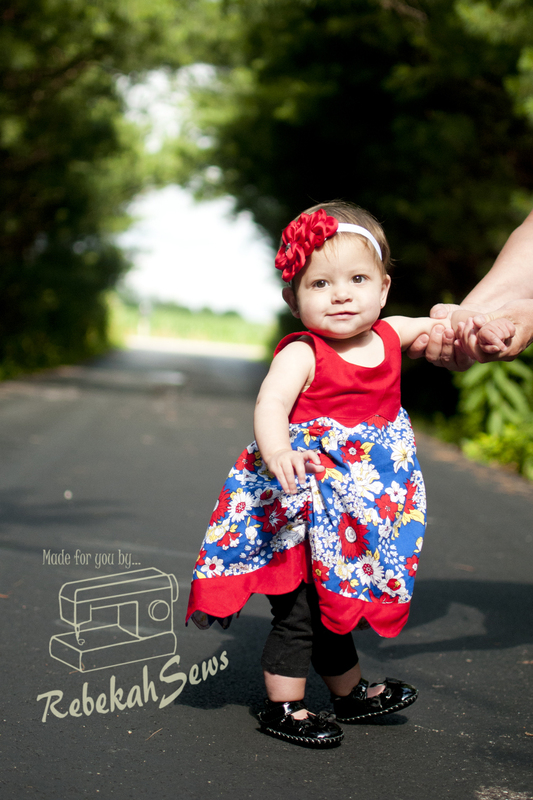 Or perhaps you just want to sew her up a summer dress? Here is your pattern to make one of these options or all of them! Pattern is $2 off during the tour too! Make sure you check out all the stops on the blog tour for more inspiration! Also don’t forget to enter the giveaway too! You never know, your wish for this pattern may come true! 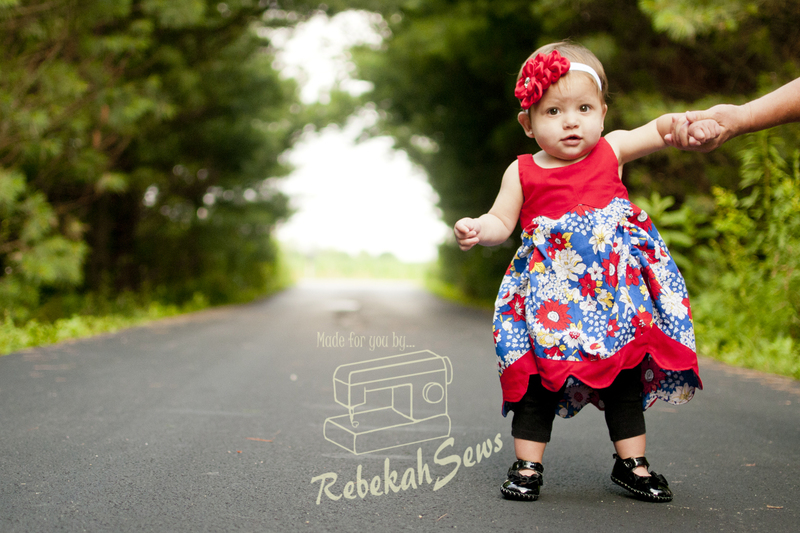 first, your little girlie is just TOO CUTE… and such a beautiful dress. it would make a lovely princess dress, will have to do one for my princess-crazed girl. the version on your girl in the colorful red fabric is looks great. and your enhancement to pull up the sides was very smart. glad you shared!